Kate Voegele has been my favorite musician since I first heard her sing and watched her on the television show “One Tree Hill” back in 2008. She is an American singer-songwriter and actress and made her debut in music in 2003. So far she has released three albums and is currently working on her fourth, hoping to be released sometime in 2014. She is not the most well known musician and most people have never heard about her. I decided to choose her Wikipedia page because I know it would not be extensively long and I know a lot about her music and life. Her page was created June of 2005 and has had a total of 937 revisions in the past 8 years; which is not much at all. 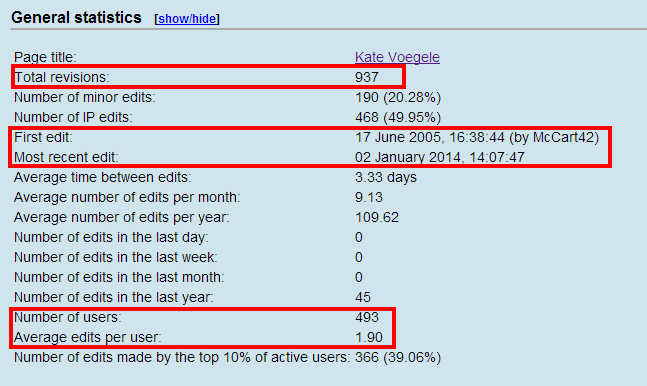 The most recent edit was made January 2, 2014 and there is only an average of 9 edits per month. In Henry Jenkins “What Wikipedia Can Teach Us About New Media Literacies” he talks about collective intelligence and how Wikipedia is the perfect example of it. Collective intelligence is “the ability to pool knowledge and compare notes with others towards a common goal” (Part 2). This Kate Voegele page however does not showcase a huge amount of collective intelligence. The whole page is mostly about her music and has nothing but a sentence about her early life and personal life. There is no knowledge pooled about her life and the page does not describe who she is at all. Henry Jenkins also mentions “collective intelligence places new emphasis upon diversity: the more diverse the participants, the richer the final outcome” (Part 2). I noticed as well in Kate Voegele’s Wikipedia page that there was not a diverse amount of participants. Therefore the final outcome is not particularly rich. As you can see there is one main user, “wkhelp” who has made 38 edits and the number of edits rapidly decrease from there. There is not a diverse amount of participants which also in turn creates mistakes that have not been fixed. The last line of the page states she is working on her fourth album and it is set to release in 2013. It is currently 2014 already and the last edit was made in January but no one has fixed this mistake yet. One thing I did notice was the most edits that has happened on her page is in 2009, more specifically May. May 2009 was when her album “A Fine Mess” was released and she was still on “One Tree Hill” at that time. This was probably her biggest and most popular album thus far. The pattern of edits seem to show that when a new album is released the edits increase as well. All in all I feel her Wikipedia page is not a great example of collective intelligence because it has been up for about 8 years now and there is not much content and only about 900 edits. 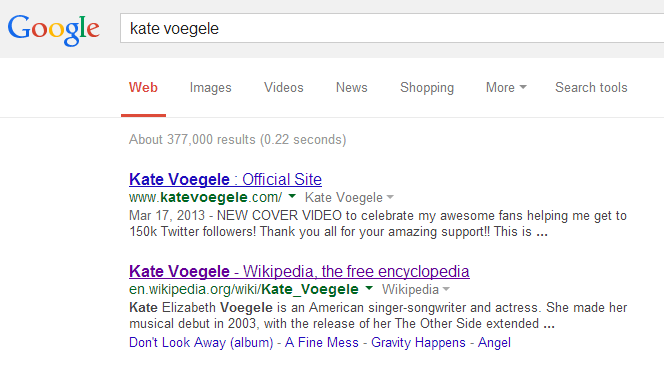 The most interesting part and another defining factor as to why it is not a great example of collective intelligence is because the Wikipedia page is the second link to show up when you Google Kate Voegele.